Half of all marriages end in divorce! We hear this all the time. It may or may not be quite true, but let's say it is. Given this state of affairs, people assume that every happy couple walking down the aisle faces a fifty percent chance of ending up divorced. And that isn't true at all. Wait a minute. I can do the math. Fifty percent of couples tying the knot today will eventually divorce. So if I get married, I have only a fifty percent chance of making it "till death do us part." Right? Think about it. Suppose that basketball statistics show that fifty percent of all free throws are missed. Does that mean that when Kobe Bryant steps up to the line, he has only a fifty percent chance of making the point? Of course not. We know that Kobe's chance of success is better than eighty percent. Mine, on the other hand, is near zero. This is because basketball is a game of skill, not a game of chance. 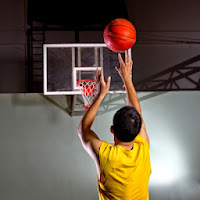 Statistics for the entire population of basketball players may be interesting, but only an individual player's performance can tell us how well that player is likely to do. When we hear a statistical generalization, our usual reaction is to view it as something that applies equally to everyone. But that is true only in cases of pure chance. If I'm in Las Vegas, betting my favorite number at the roulette wheel, I have only a one in 38 chance of winning. The gal next to me, betting her favorite number, has the same chance. Everyone at the table who bets on a number has the same chance as everyone else, and nothing any of us does can change that. The outcome is determined by forces beyond our control. Basketball isn't like that, and neither is marriage. The progress of a relationship, like the progress of a basketball game, depends on the actions of the participants and the quality of their teamwork. A top player can't guarantee that every shot he makes will score. But his skill, determination, and effort mean that his chances are far better than average. Approaching marriage with high levels of awareness and commitment means that we do not have to fall victim to statistics or depend on luck to get us through. Because marriage isn't something that happens to us at random -- it's something we do ourselves. High five, Rosemary! This is one of my very favorite posts, and I never thought about that statistic in that way. Of course, it makes things crystal clear. We have choices. How empowering is that! So marriage is a game of skill? I like it! That stat always bugged me. I looked at it as "all marriages" not all couples. The people getting married 3 times squew the numbers. I have seen some statistics that claim that second marriages fail at a higher rate than first marriages, and third marriages fail at an even higher rate. Actually, this makes sense. People rarely change. Nina, that's definitely one possibility. People who are in a second marriage have been through divorce before (assuming the first marriage ended in divorce and not widowhood). It may be that they are simply more willing to use divorce as a solution than people who never got divorced. On the other hand, some people learn from their experiences and do better the second time around. I know a lot of people who had brief first marriages and are now in happy second marriages that have lasted for decades. Average statistics don't mean much when it is clear that the outcome is going to be affected by choices and behavior. Some people have a 100% chance of getting divorced!